The sale of one of the world's major repositories of news photographs recently means that it has suddenly gotten a lot harder (we discovered just today) to locate many archived images of news events from the recent past. We are passionate about wanting people to be aware of some of the less-well-publicized aspects of terrorism and what it means when it's done to you. Three news photos were published in October 2011 that recorded an event connected to our lives but basically unknown to almost anyone else. 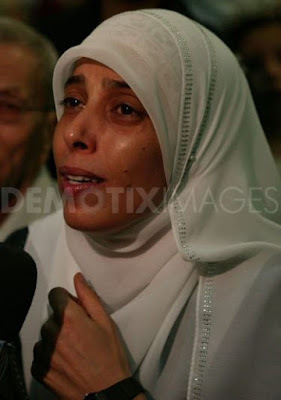 In October 2011, the notorious chief engineer of our daughter's murder, sentenced a few years earlier to sixteen terms of life imprisonment with a recommendation from the judges that she never be considered for parole, was set free by Israel. The following day, she arrived in another country where most of her family had lived since before she was born (and still lives). She herself was born there. Joyously received as a returning hero, she was greeted with pomp, ceremony and emotion at a gala reception in the Family Court of that country, located in its capital city. The on-line photos we mentioned above that record the reception in the court house may be the only evidence that it happened. Now, with the sale to a Chinese firm of the major news photo archive that housed them, that evidence will inevitably become hard to find. That is a great pity because those pictures reveal something worth knowing. Before going into the background, please notice that we have just posted those pictures at the foot of this article. We have mentioned them numerous times in this blog. It's important they be seen. People need to appreciate the painful and damaging double-talk that is integral to the global conversation about terrorism. Here's the back-story. 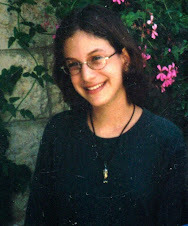 Our daughter Malki, a beautiful and accomplished 15 year old, was murdered in a horrifyingly effective terrorist attack done by Hamas on a pizzeria in the center of Jerusalem on August 9, 2001. The attack's chief planner and engineer - and also, in a literal sense, the bomber - was a young woman of 21, a university student and a news-reader on television. She was soon arrested, tired and convicted. A panel of three judges in an Israeli court sentenced her to several lifetimes behind bars. In front of the judges, she boasted of her central role in the killings, admitting everything, denying nothing. She grinned and gloated at the death toll. She declared that sooner or later she would walk free. Sadly, these were prophetic words. This confessed multi-murderer lives a charmed life of total freedom today, living in a city a mere 90 minutes drive from us in a country that enjoys good diplomatic relations with the United States and with virtually all of Europe. It has relations as well, not warm but nonetheless proper and ongoing, with Israel. Jordan remained a key ally and a model partner in combating terrorism and extremist ideology... Jordan demonstrated regional leadership in the fight against ISIL... and participated fully on the diplomatic, political, financial, and military fronts... Jordanian prisons have a religiously based de-radicalization program that seeks to re-engage violent extremist inmates into the non-violent mainstream of their faith. We don't make foreign policy, and to state it mildly we have different priorities. We don't understand the State Department's enthusiasm for its Jordanian key ally and model partner. In addition, we are appalled [as we noted in "18-Feb-15: Countering Vacuous Euphemisms"] by the vague and cloudy view expressed by key State Department people on terrorism. Plainly, we feel more invested in the issues at a personal level than many US government officials do. That's human nature. We tried to convey a sense of how that works in this post: "14-Sep-13: Memo to Secretary of State Kerry: Your staff need some urgent guidance". How opposed is Jordan to terror? Frankly, it's a very selective kind of opposition. Sometimes - certainly not always - it acts like a government that holds a tough, uncompromising view of terror and its practitioners. We took a look at how that works, for instance, in another blog post of ours last year: "04-Feb-15: The stunningly different fates of two terrorists in Jordan and what they reveal about how the war against terror is going". Regular readers of this blog know about another Jordanian female, an ex-prisoner, also a terrorist, with a different fate: Ahlam al-Tamimi. 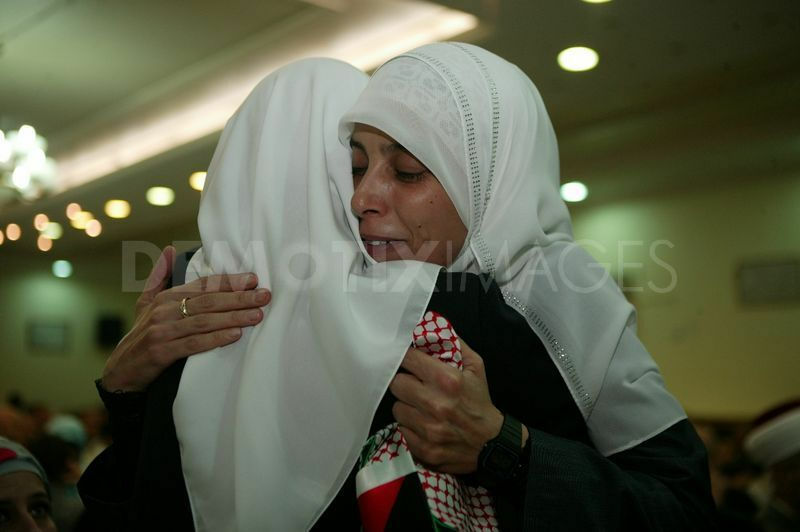 Unlike Mrs al-Rishawi who was hanged today, Mrs al-Tamimi is a Jordanian, born, bred, educated and (following an 11 year-period spent outside Jordan) now living with her husband/cousin, in Jordan. Tamimi has over and again confessed [via this video interview, among numerous other instances] freely, proudly and happily to the massacre at Jerusalem's Sbarro pizzeria in 2001 for the engineering of which she was convicted. She was sentenced to 16 life terms in prison with a judicial recommendation that she live the rest of her life behind bars with no possibility of a commutation of sentence. That is not how it worked out. She was one of 1,027 terrorists set free in the extortion-driven 2011 Gilad Shalit Israel/Hamas transaction, despite a campaign we personally waged for years. We urged our government to stand firm, to not give in, to keep this particular sociopath behind bars so that justice could be done... Today she is a globally-influential instigator of jihadist terror - an icon of hatred. What Jordan - a sovereign state at least half of whose population defines itself as Palestinian Arab, and ruled by a dynastic family from Saudi Arabia - ought to do with its terrorists is emphatically not our concern. Jordan's laws that purportedly outlaw terrorism... don't get the critical attention in the West that they richly deserve. 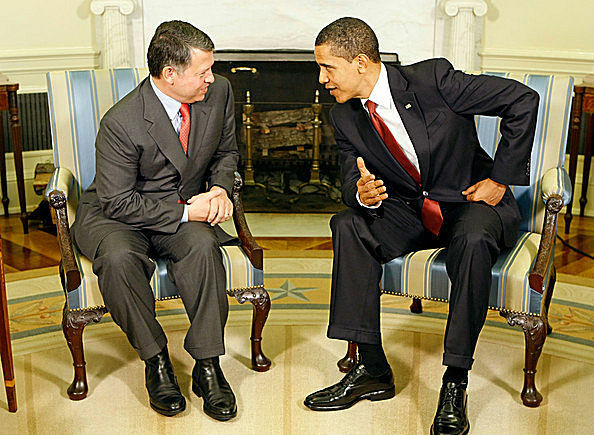 Actually, there's a lot about Jordan that doesn't get scrutinized. And should. We wish there was wider public awareness of what a congenial environment Jordan has given the woman who masterminded the murder of our daughter. Since returning to Amman in 2011, the authorities there have allowed her to operate unhindered. The examples are many: she is permitted to speak as an honored guest at its universities, its professional guilds, its law courts and a laundry list of additional venues. She records her own heavily-promoted weekly television program in Jordan's capital city; from there, its toxic message in praise of the power of murder is beamed to millions of Arabic-speaking households throughout the world. Thanks to Jordan's indulgence and acquiescence in the process, the convicted and unrepentant murderer of our child has become a world-class pan-Arab celebrity. It could never have happened without their ongoing co-operation. 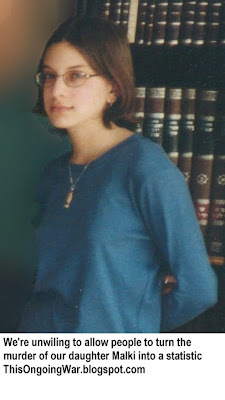 She was the first female to join the ranks of Hamas terrorists, later graduating to become an eloquent figure advocating energetically - from Jordan to the world - for more violence, more murder and more jihad - all of it, let there be no doubt, directed at Jewish and Israeli targets. Inciting via television and a range of social media platforms (Twitter, Facebook, YouTube) and well-publicized personal appearances, she is one of the most widely-recognized, very public faces of the savage Islamist bigotry of Hamas and the Moslem Brotherhood. People ought to know more about her. The news report of which the three photos above from the Family Court of Jordan in Amman are a part is now accessible at this archive location. That's important because both the report and these photos can no longer be found via a regular Google search. What real messages are those partners and allies conveying to their masses - and especially to their children and adolescents and unemployed young men and women - when they do it? Why are we, the parents of a teenage girl murdered by a fanatical agent of jihad, among a very small group of voices being heard (and mostly ignored) exposing and decrying this appalling state of affairs? My heartfelt sympathy for the grief you have to endure every day of your lives. That an evil murderer such as Ahlam al-Tamimi should be allowed to live the life she does in Jordan is an affront to all humanity. I don't know how King Abdullah can sleep at night - knowing such a despicable woman is roaming free in the kingdom he rules. I don't understand how President Obama can shake the King's hand and welcome him at the White House whilst Abdullah allows a convicted murderer like her to spruik her opinions on TV and travel throughout the Arab world to incite others to commit further violence against Jews. The release of those 1027 terrorists by Israel - including al-Tamimi - was one of the worst decisions made in Israel's history. One can only hope that it will never be repeated again. Thank you for articulating your rational, warm and supportive views. We remain passionate about the land where we live by choice and where we have raised our family. But we remain cold-eyed about how public opinion gets shaped everywhere including here. The Shalit Deal was, as you say, awful - the wrong outcome for the worst reasons and with a heavy price that will continue to be paid by innocent people. But it would be a mistake to think that lessons have been learned here or anywhere else other than (mainly) by those who are invested in the process and its outcome. Lessons can't easily be taught to publics. Their views get shaped by a complex of things, some respectable, some deplorable, some foolish, some based on manipulation. That's probably been true everywhere and at all times. This does not exempt those who see the depth of the mistakes to suffer in silence. Our fate is to have to continue to speak up and hope some small changes for the better will follow. And even if not. A media person/organisation should register with Demotix and "Join the conversation" for these photos. The current caption states "a Jordanian prisoner during a reception".